A top White House national security adviser and key proponent of the Obama administration's diplomacy with Iran is the focus of a congressional inquiry following disclosures the FBI may have denied him top-level security clearances, according to communications exclusively obtained by the Washington Free Beacon. 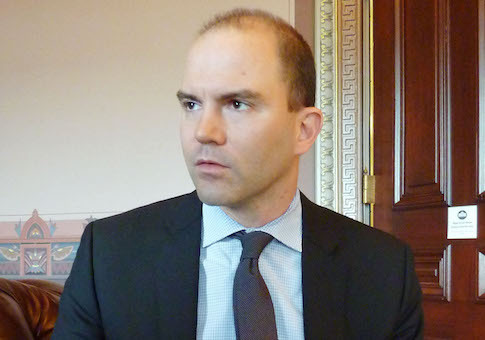 Ben Rhodes, a White House deputy national security adviser who led the administration's efforts to mislead Congress about the terms of the Iran nuclear agreement, is under scrutiny in the wake of disclosures he was declined interim clearance status by the FBI in 2008, when the administration was moving into the White House. Since that time, Rhodes has emerged as a key adviser to President Obama and a major player in the administration's efforts to create a self-described pro-Iran deal "echo chamber" to mislead Congress and Americans about the terms of the Iranian nuclear agreement. Lawmakers are now concerned that Rhodes' access to the top levels of government—including its diplomacy with Iran—is inappropriate due to the FBI's concerns about his past. "Recent reports indicate the FBI denied, or was going to deny, Ben Rhodes an interim security clearance during President Obama's transition," Reps. Trent Franks (R., Ariz.) and Jim Bridenstine (R., Okla.) wrote in a recent letter to FBI Director James Comey, according to a copy obtained by the Free Beacon. "This previously unknown fact is extremely troubling and calls into question the integrity of the FBI's protocols and the wisdom of Mr. Rhodes' continued government employment," the lawmakers wrote. Individuals can be denied security clearance for a number of reasons, including a criminal record, history of drug use, or "questionable foreign ties or relationships." The latter possibility is raising concerns among lawmakers and veteran foreign policy insiders who say that Rhodes' history of promoting diplomacy with Iran may have been the reason for his disqualification. Emails released as part of a hack on Obama administration confidante John Podesta confirm that Rhodes was not able to pass preliminary background checks by the FBI in 2008. "We agree that it would not be worth pushing for Benjamin Rhodes to receive interim status," Obama transition team members wrote to Podesta in October 2008. "For your information, out of the approximately 187 people who we have moved through the process Benjamin was the only person declined interim status," the email said. The FBI was to complete a full review into Rhodes after the transition. It remains unclear what they concluded. Rhodes, an integral member of the president's inner circle, currently holds all relevant security clearances related to his leading role in the White House, according to one government official who spoke to the Free Beacon about the matter on background. Rhodes was granted full security clearance before Obama's 2008 inauguration, the source disclosed. The source cast doubt on the integrity of the Podesta emails, which are believed to have been hacked by Russian agents seeking to influence the U.S. election and politics. Franks and Bridenstine expressed alarm about Rhodes' initial rejection and are seeking further information from the FBI about what exactly disqualified Rhodes. "For the FBI to evidently find something in Mr. Rhodes' background that led it to potentially deny him a security clearance only to have Mr. Rhodes work at the highest levels of the Obama administration shakes the entire clearance process to the core," the lawmakers wrote. "Mr. Rhodes has working in the White House for the past seven years and is the architect of the Iran deal ‘echo chamber,' as he recently described himself." "We can only hope the FBI was ultimately satisfied with its ability to investigate Mr. Rhodes and felt that it had sufficient freedom to decide whether or not to grant Mr. Rhodes a security clearance," the letter states. The members are asking the FBI provide further information about the issues over Rhodes' security clearance. This includes information about whether Rhodes currently has security clearance and if the FBI was given a proper amount of time to vet the senior staffer. The lawmakers also are seeking to learn if the Obama administration applied political pressure to the FBI in order to obtain a security clearance for Rhodes. One veteran foreign policy operative in D.C. who is familiar with the matter said the clearance issues could be linked to Rhodes' longtime efforts to promote U.S.-Iran diplomacy. "Everyone knows that the push for Iran engagement as far as the beltway elite are concerned began with the Iraq Study Group. Ben Rhodes wrote that report," said the source, who requested anonymity to speak freely. "Who knows who whispered those ideas into his ear." The White House National Security Council declined to comment on record about the matter. Update 2:28 P.M.: This story has been updated to clarify language regarding FBI security clearance. It was also updated to include more information from the government official who spoke to the Free Beacon on background. This entry was posted in National Security and tagged Ben Rhodes, FBI, Iran, Trent Franks. Bookmark the permalink.